The Church of Christ was established in A.D. 33 on the day of Pentecost when Peter preached the first gospel sermon. (Acts 2). The Church of Christ was built by Jesus Christ, purchased by His blood and He is the head of the church. Christ only established ONE church. The Southside Church of Christ has a rich history. At the age of 19, Dr. Carl C. Baccus was an associate minister at the Figueroa Church of Christ in Los Angeles, California. The minister of the Figueroa Church of Christ, Richard Nathaniel Hogan (a pioneer evangelist) conducted a citywide gospel meeting in 1956. A Baptist preacher was baptized along with some of his members. Bro. Hogan asked Dr. Baccus to go and work with this new group of members in Watts. Six families of the Figueroa congregation went with Bro. Baccus to help build the congregation. The original members brought their own expertise in building the congregation. Some were administrators, office workers, financial analyst, but most importantly teachers of the Word. 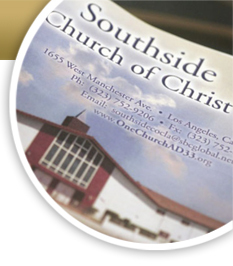 The Southside Church of Christ met in several locations across the city of Los Angeles before the wandering stopped. Each move lead to something bigger and better until the South-sid-eans purchased property and built a state-of the-art home at 1655 West Manchester Avenue. The first worship service in their current location was on Sunday, August 24, 1980. In true character, the members sang praises to God for all of His blessing. The services continued to be uplifting when Dr. Carl C. Baccus preached that first sermon… it was powerful! The gospel was proclaimed and souls were added to the Church of Christ that meets on the Southside of Los Angeles.